High Quality Video + Audio Baby Monitor with Unlimited Range (Wi-Fi, 3G, LTE, Bluetooth), Noise and Motion Alerts. Excellent choice for secure home and travel baby monitoring. Easy to use, works on any iPhone, iPad, iPod touch or a Mac with no configuration. 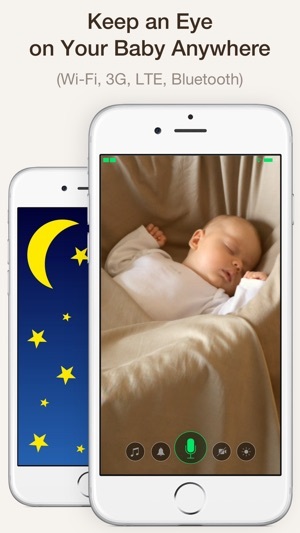 Endorsed by Kim Komando (komando.com) as a video baby monitor for iPhone. 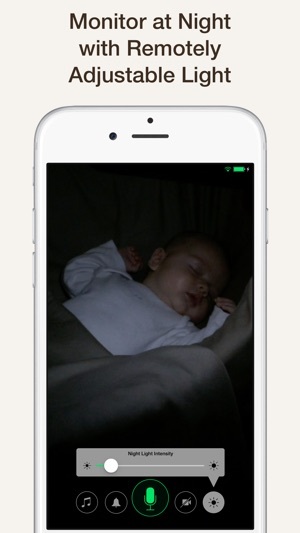 Easily soothe the baby with live video and audio streamed from the parent unit to the child unit. Happy customers are our highest priority and your feedback is always welcome. We are reading all AppStore reviews very carefully. 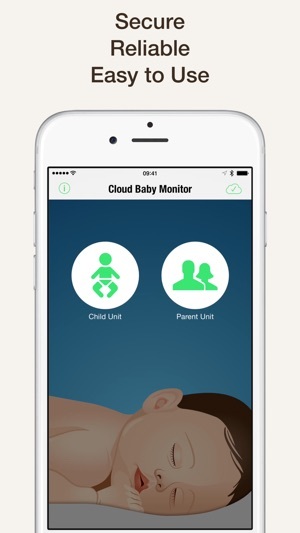 If you have any issue or suggestion, please contact us directly at support@cloudbabymonitor.com. After 4 years with this app, it works perfectly every time. We have used this since our daughter was a baby. It has worked better than any baby monitor out there. With the ability to connect WiFi, cell, or Bluetooth, it worked no matter where we were. When one connection fails it automatically finds the next possible connection. My daughter is four now, and we still still use it to monitor her when she is playing upstairs in her room and we are downstairs cooking. The fact that it has an Apple TV app comes in handy when we have company and the kids are upstairs playing and the are downstairs. We can see all of the shenanigans going on. The battery drain is great if you have it on just audio and even better if you are viewing it on an Apple Watch. Yes! You can do that. We have have even used it on a cruise ship where the Kidd have their own room and we are next door. The Bluetooth connection doesn’t skip a beat as long as it is in range. In my opinion, this by far the best app ever made. It does what it suppose to do every time and works anywhere with internet or without. This app keeps impressing me every time we find a new purpose for it, it comes through every time. My husband and I bought this app after a failed attempt to use the traditional walkie-talkie style baby monitors. We have used it from the moment we brought our daughter home. 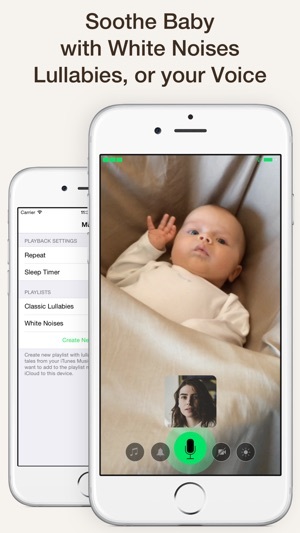 It allows you to see your child like using Facetime or Skype and you can speak to them. We love the sounds and lullaby’s on it as well. It’s especially useful that you can change the volume and turn the sound on or off from your end of the monitor. It had been user friendly even for someone who lacks technology know-how, like myself. Now that our little one has learned how to crawl out of her crib, we are using this app to catch her before she can crawl out. We can calmly discipline her through the monitor. Our only problem with the app is that once you turn on the music or adjust the light on the receiving end of the monitor, the adjuster graphic stays up so that some of the video is blocked. It would be nice if it went away or you could click it away or something. But it’s not that big of a deal. If you have a couple of Apple devices and a baby, then I highly recommend this app. Reading the other reviews, I don't hear any white noise after updating to iOS 10. Perhaps it's the old device you're using. We're using a somewhat broken iPhone 5 to monitor our son & sometimes using one or the other (iPad 2 [can't update to iOS 10]/iPad 2 air/iPhone 6 plus/iPhone 6S) to watch & listen. 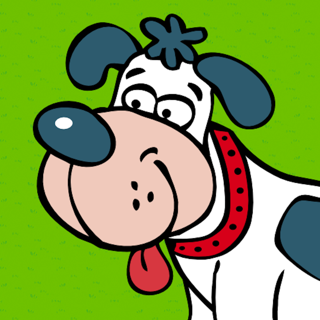 However, before the updates (2nd to last update via app) I was getting some white noises. On the scary side, my wife said she heard someone breathing on our devices when our son is asleep in his room during those white noises?!? True story! That only happened one time. Now the white noises are gone. Other than the white noise, sometimes now & then I get a red screen with a beeping saying, "lost connection" to my iPhone 5. It used to do that A LOT before the iOS 10 update & before the last app update. All app is never 100% perfect & we all know that. 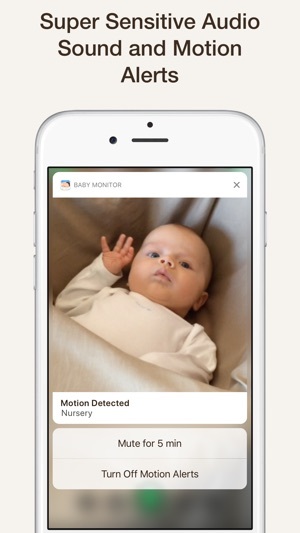 But this app is way better than paying over/around $200 for those other baby monitors. And you can also use it as a security cam within your home & turn on the noise & motion alert to get the notifications! !